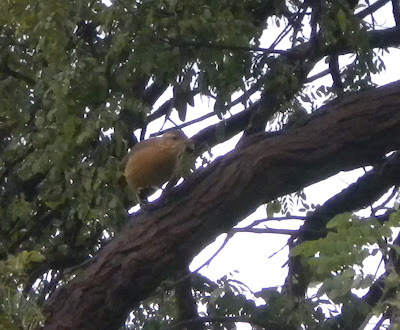 Birdchick has her NBB (Non-birding Bill) and I have my own NBB (Non-birding Brother). Well...I have three non-birding brothers, but this one in particular was born the day before my 1st birthday robbing me of a celebration that should have been all my own. Actually, I could take the perspective that he was my first birthday present and therefore he is to spend a life of servitude to me, or at least as my pet. When his work was taking him to Brazil I basically forced him to do some vicarious birding for me. As you will see from his post below it should be a law that non-birders should not be allowed to travel to exotic locations - only birders should be allowed to travel because only they truly appreciate the avifauna. I served a LDS mission in Argentina in 1996-98 and my brother served a mission in Brazil from 1997-99, so we over-lapped a year in South America. How cool is that that he got to go back?! I speak Spanish and he speaks Portuguese. The languages are similar enough that we can converse and understand each other as we make fun of the rest of the family. 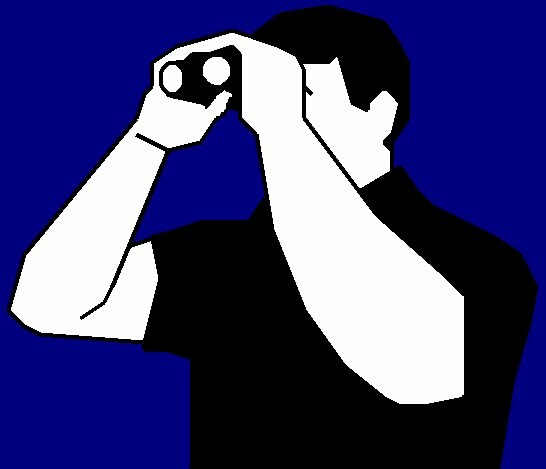 My non-birding brother's writing is always good for a laugh, so enjoy! Sometimes I get lucky and my job sends me to places that I actually want to go. Such was the case last month when I was sent to Brasilia, Brazil to do some consulting with the Brazilian Air Force air traffic controllers. The thought that immediately came to mind was of a great new place to go geocaching. I happened to be on the way to my brother's house for a free dinner when I got the call, so I was excited to share the news. His thought immediately was of a great new place to go birding. He even loaned me a book to help me identify all the amazing birds I would see. Based on the weight of the book I decided I would just try to take pictures and let him identify the birds himself. I guess he is just too lazy to do all the work for me, so here goes my attempt at identifying and writing about birds that I've seen. 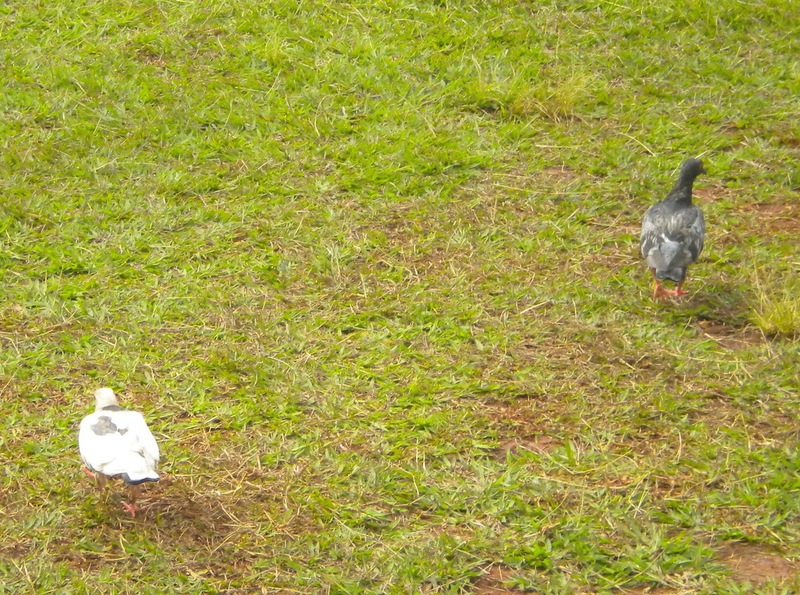 There were different colors of pigeons, some of them had spots on them. In the plaza near the the capital building there were a great number of pigeons hanging out in a rather large dovecote that was designed by world famous architect and noted communist Oscar Niemeyer. You've heard of him right? 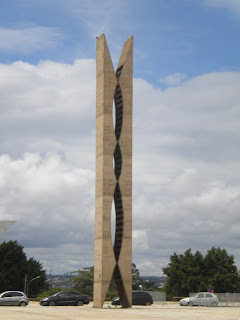 Yeah, he's probably the coolest architect I ever learned about in my History of Brazil class. The book lists several kinds of pigeons, but the only one I can definitely say that I saw for sure was the pombo-domestico, or rock pigeon. These pigeons are different from the common American pigeons in the following ways: they live in Brazil, and poop on statues of presidents like Juscelino Kubitschek and Getulio Vargas instead of presidents like Washington and Lincoln. I had an afternoon free so I decided to go geocaching with the only other person I was travelling with who had heard of the sport. We decided to walk up one of the "embassy row" streets since there were some good geocache hiding woods and not much traffic. 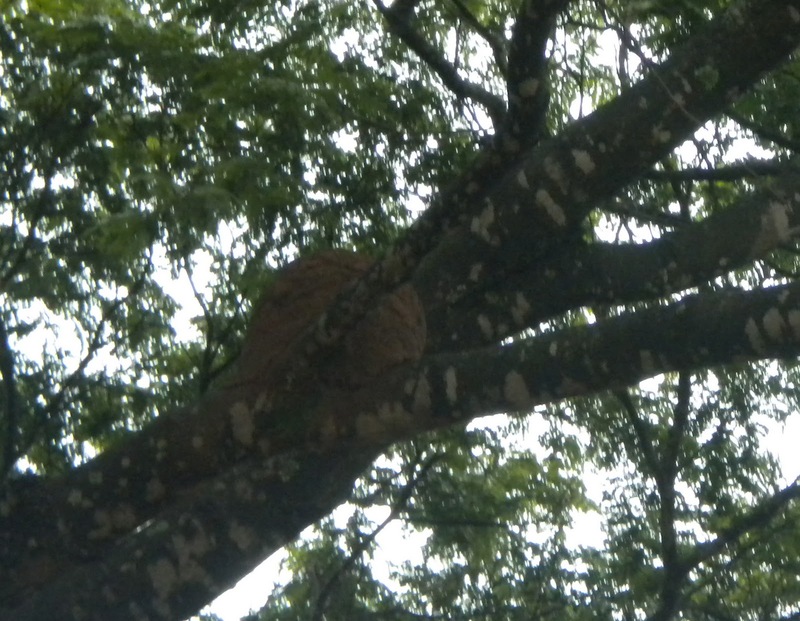 In the woods on either side of the street we saw several holes that we assumed must have been dug by some relative of the ground squirrel or prairie dog (whistle pig for you Idahoans), but were surprised to see some big owl eyes looking back at us when we peaked inside one. 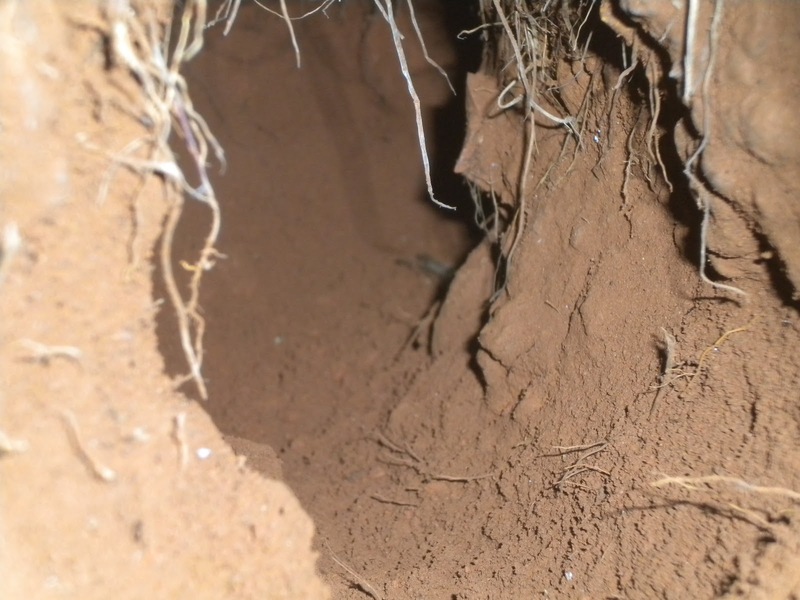 I quickly grabbed my camera and snapped this picture of what a hole looks like immediately after the owl inside backs around the corner. 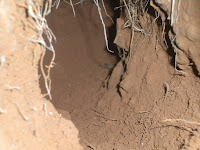 We saw more owls standing around their holes and figured that living in holes must be common for these guys, and so stopped our search for terrorist whistle pigs who were taking owls hostage. 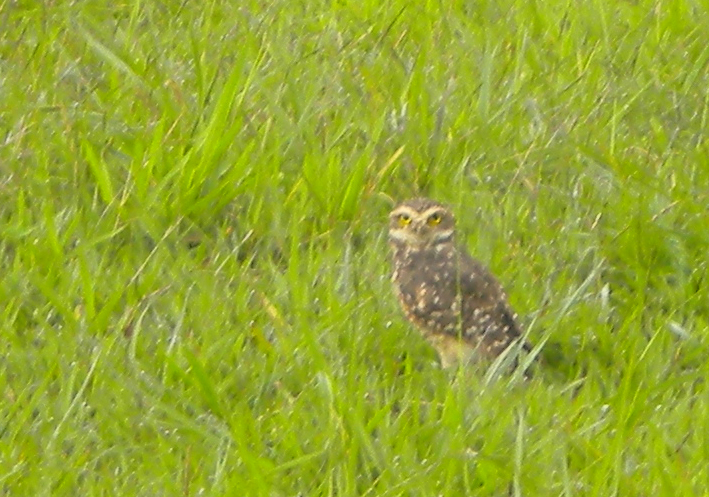 Looking the owls up in the book showed me the coruja-buragueira, which translates to hole-owl, or "burrowing owl" for those of you that insist on using the correct names. 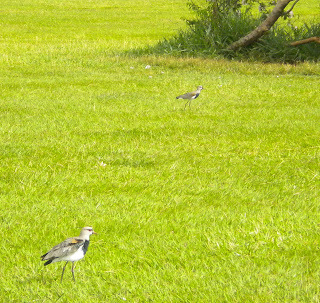 In the same area we also saw some birds that I identified as road runners. I saw them on the road, and I saw them running. This birding thing is pretty easy. 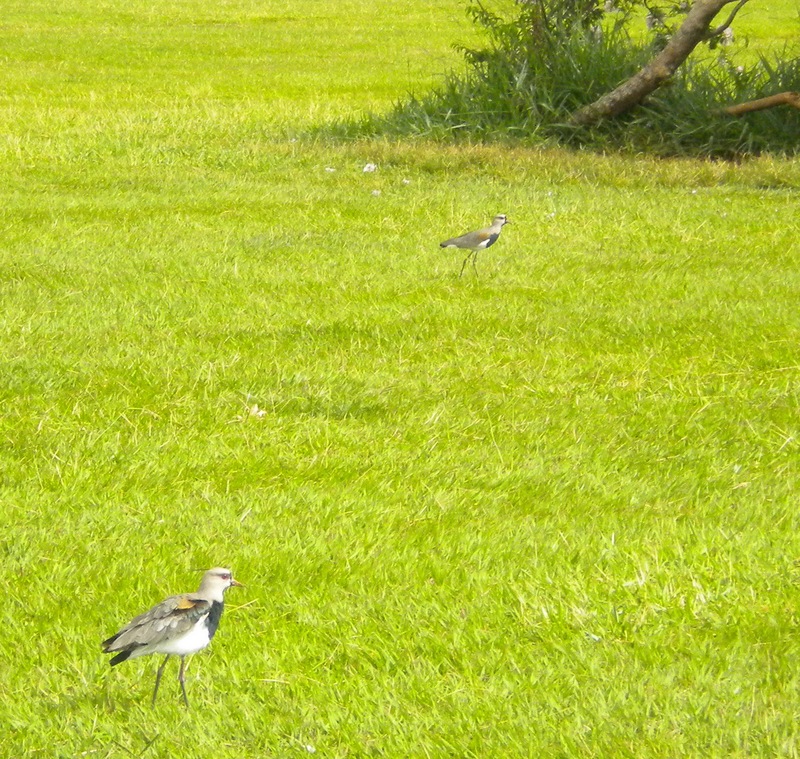 After returning to the book I found a picture of my Brazilian road runners under the label of Quero-Quero or Southern Lapwing. Knowing that Quero-Quero definitely does not translate to Southern Lapwing (I want-I want) I immediately lost all confidence in the book and its authors who can apparently publish whatever they want without regard to the feelings of its readers. I had previously seen these types of birds while doing a similar job in Uruguay a few years ago. I saw them again in the street in front of the Uruguay embassy. I assume that the Uruguayan ambassador is involved in some kind of illegal bird smuggling operation, probably hoping to usurp Brazil as the leading economic power in the region starting with it's bird population. 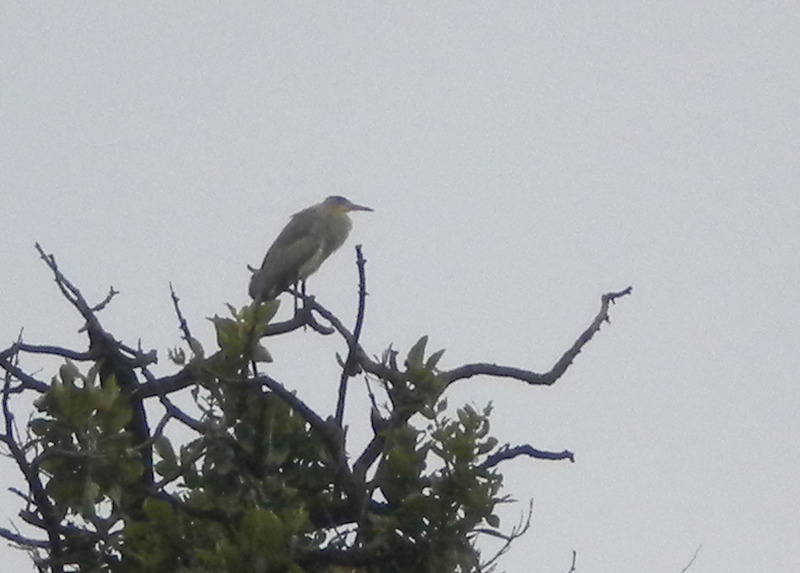 Another bird in the same area was a big grey one that looked like a heron. I took some excellent action shots of it flying away whenever I got close enough for a good shot. 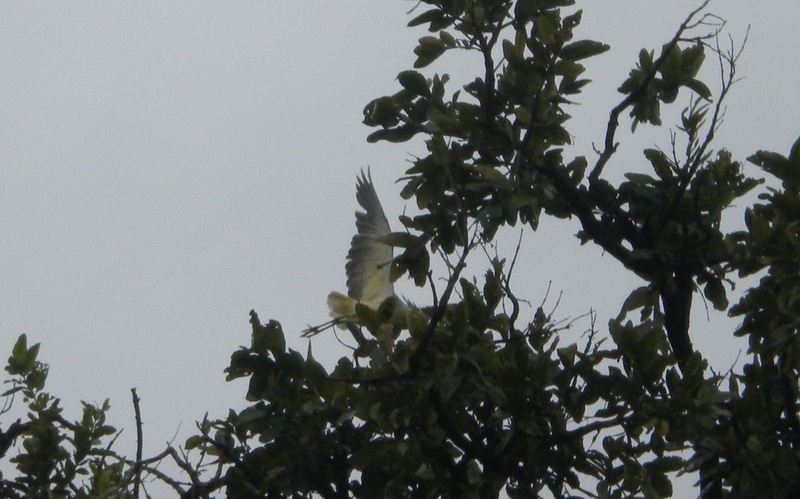 I could see that it had gray wings, was white on the underside, and had some yellow in the tail feathers. I can, with almost no certainty, identify it as the Cocoi (or White-necked) Heron based on the map that shows them living everywhere in Brazil and the Gray Heron being a vagrant from Europe. Brazil has very little tolerance for foreign vagrants, so the Gray Heron would be a long shot. I saw a lot of little golden birds, around my hotel and in the same stretch of woods near the embassies. Finding the trees they were in, I saw several mud nests that looked like old fashioned ovens (or hornos as those who unfortunately speak Spanish call them). Luckily there was a whole page of Horneros in the book to compare against. All of them look the same, so I'm going with Rufous Hornero based on the dark legs of the birds I saw disqualifying them from being Pale-legged Horneros. As a side note, Horneros in Brazil are commonly called Johns. Little John, Pale-billed John, Adobe John, etc. If that bit of knowledge ever helps you on Jeopardy I'll expect a cut. Hanging out with the little golden bird was this little gray bird. 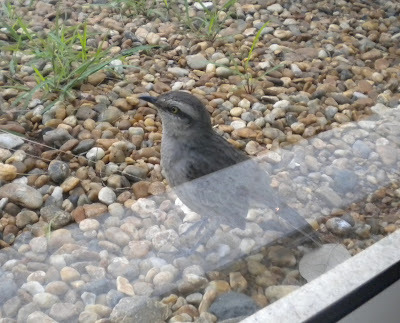 There are lots of little gray birds in the book, so a special prize to the person who identifies it from this picture alone--taken through the glass of the hotel lobby window. Scroll down for your prize. 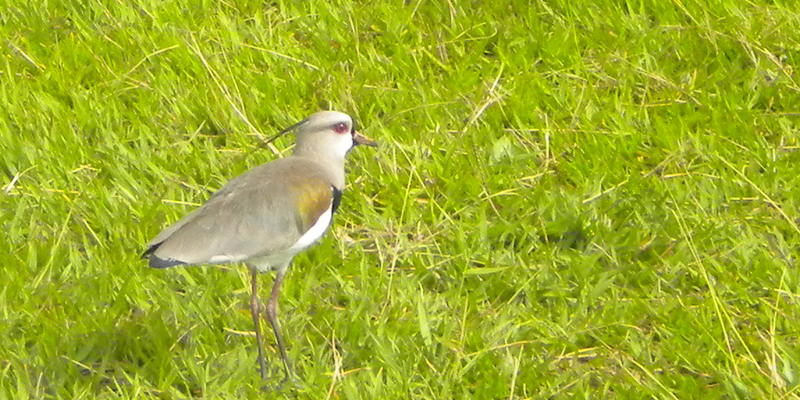 There was another bird that I saw a few times, but they were always at times when I did not have my camera with me. I asked my driver what they were called and said Perdiz was the common name. You probably wouldn't find that in any other birding book except the one specifically for Brazil, but there it was on Plate 26, the Perdiz, or Red-winged Tinamou. and a yellow head with some red on the beak like the Great Tinamou. Well, that's it folks, my first and probably only post about birding. I assume that I won't be invited back, based on the jealousy of getting to name my own species. 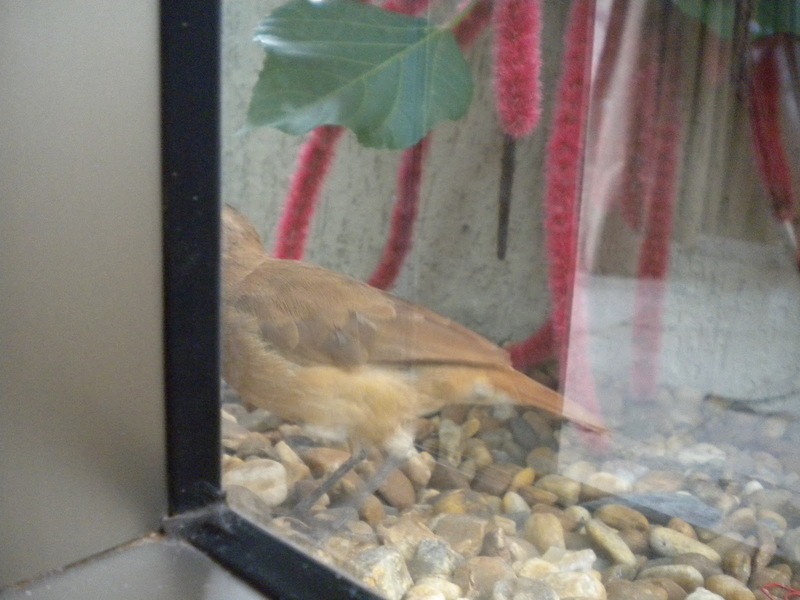 Almost forgot--here's the special prize for those who identified the little gray bird. Don't scroll down and look at it if you didn't identify it. No one is more honest than the die-hard birder. I'm sure everyone believes you when you show them your life list and "starling" is not the first bird listed. These are pictures of some of the 15 peacocks in my backyard that poop on my deck every time that I clean it. I am laughing so hard that I have tears running down my face - what a crazy brother you have! You got a ncie new list of bird I guess and congrats on the nice pictures! Really hilarious. Robert, I'd love to be a fly on the wall when this joker brother of yours visits. Great laughs! Especially love the Road Runner ID! Thanks for the comments everyone! My brother is a funny guy and it really shows when he writes. I take credit for it as adversity tends to produce creativity in people...and I used to beat him up a bit when we were boys! LOL! what a hoot! This was so much fun to read! You must have developed such a great sence of humor from having to deal with an older brother! I know what THAT is like! Still, he is an excellent birder and I think you should keep him! Let's hope he is an excellent brother also! P.S. Just read the comments and Robert, I must tell you that my older brother beat me up too! No fun! (The comment above was for your brother. This one is for you Robert!) I'm glad to know you 2 get along now! Oh, this was funny. Very, very funny. Thanks for the great post and entertainment! @Kiirsi - funny how we birders loved to be mocked by the non-birders. An outside perspective helps us see how funny some aspects of the birding world culture are.